Noah David was still born on October 19th, 2013 at 19w4d after a day and a half of labor. He is survived by his mother and father, a two year old brother O, 2 aunts, 3 uncles, 6 grandparents, 7 great-grandparents, and countless friends. After struggling to conceive our oldest son O, we were thrilled to conceive Noah without fertility drugs. And hopeful that we could avoid prematurity and NICU time this time around. I had severe Hyperemesis Gravidarum. By 5w I was on anti-nausea drugs. By 6w they were given subcutaneously round the clock through a pump. At 7w I had 1 ER trip and 1 hospitalization, both for IV fluids. At 8w I was hospitalized again, and a PICC line was placed so I could get daily IV fluids at home. I was on bedrest starting at 9w. I lost 30lbs in 12 weeks. All of this as a SAHM. I started to get better around 16w (not losing more weight, but not gaining.) On October 1st we had an ultrasound at MFM. We found out we would have another son, and that while they were having a hard time getting some pictures due to size and positioning, everything they could see looked fine. The next day I got a call from the doctor. He decided to take a closer look at the images and thought the ventricles in Noah’s brain might be enlarged. We were told to come back in one week. A week later, there was no might. They were 2-3 times normal size, and there was almost no visible brain tissue. Just fluid. And a cyst in the back of his brain crushing the little bit of cerebellum that had developed. We were told he would never breathe on his own. Our world ended. A week later we drove 2 hours away for an induction. 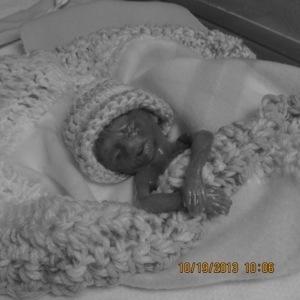 Noah died during the induction and was stillborn on Saturday October 19th. Now we try to figure out how to go on without our youngest son. I’m so sorry to hear of your loss of precious Noah. I lost my son Luke and this is such a hard road to be on. I will add you to my prayer list for comfort and healing. I’m so sorry for your loss. I don’t have children, but I do know no parent should have to go through what you are. I lost my mom to cancer a few years ago, and while it is a very different loss, I do relate to your feelings of anger and wanting things back the way they were. I’m keeping you and your family in my thoughts. I’m so sorry for you loss. I just read through your entire blog and wanted to tell you that even though I have never suffered a loss the magnitude of your loss my heart still breaks for you. You are (as is everyone who has ever suffered a loss) entitled to deal with your own grief however you feel fit. No one gets to dictate what is okay and what is proper. As long as we all continue to get up and breath then we are dealing with it in an acceptable manor. Continue to breath and continue to remember and continue to share with us. This community always embraces and always helps. Sending you love and light and praying for you and your family. It’s stunning how many of these things can happen, and how sudden they are. We’re praying for you all. No lies here. It’s awful, and it really has to be, since you guys love Noah and want him here. I’m so sorry for the loss of your baby Noah. He is so handsome. I also lost my baby girl at 19 weeks and 4 days. Those first few months after the loss are just so hard to get through. I’m praying for you. I am so sorry for your loss. No parent should ever have to bury their child…..I am so sorry you had to do so. Thank you for being brave enough to share your story. Your angel is just beautiful! Thank you. I am sorry for your losses as well. I am glad you have pursued answers. I am glad to have found your blog. I am so very sorry for your loss. Your little Noah is precious, and reminds me of our own Sophia who, born alive at 20 weeks, had conditions incompatible with life. We too had found out through an ultrasound that something was very wrong, and shortly after she was born. I am so sorry for the struggles you have had surrounding the pregnancy. I see in your most recent posts that you are pregnant again, and so I hope the best for you and your family. I look forward to following your story and journey. Best wishes. Thank you. I’m sorry for loss of your Sophia. Noah looks just like our little daughter (our first), who was born at 18w2d. I just saw the news about your rainbow, and am very happy for you. Wishing you and your family the best.